Kiz Kulesi is a medieval tower on a tiny island in the Bosphorus Strait. The Tower was used as a castle, a defense point, customs, warehouse, lighthouse and a water reservoir. Today the building hosts a restaurant, cafe and a bar inside it. Favorite place of lovers! Maiden's Tower in Istanbul. Photo by Ago 70. Location: Uskudar Salacak Mevkii, Istanbul. Southern entrance of the Bosphorus. Off the Uskudar shore. Get a boat from Katabas (near Dolmabahce Palace), Eminonu or Besiktas to Uskudar. Walk to your right for about 5-7 minutes. You can also see the tower from your Bosphorus Cruise. Hours: boat to Maidens’ Tower leaves every hour (11:00 for example). Boat from Maidens’ Tower leaves at quarter to hour (13:45 for example). Uskudar (Salacak stop) every day 9:00 - 18:45. 20:15-00:30 (after midnight). First legend of Kiz Kulesi unfolds around Seyyid Battal Gazi, mythical warrior from Turkish folk literature. It is said Battal Gazi and his soldiers came to Istanbul from Malatya, a city in eastern Anatolia, around year 700. They came to siege Istanbul’s treasures. Seyyid Battal built a camp on the shore of Uskudar (region in Istanbul’s Asian side). The governor of Uskudar got scared of the famous warrior. To protect the most valuable, treasures and his beautiful daughter, the governor hid them in the Tower on an island in Bosphorus. The legend says Seyyid Battal fell in love with the governor’s daughter. He rowed a boat to the Tower, stole the treasures and kidnapped the beautiful girl. Back on the shore Battal Gazi mounted the horse and off he was. In Turkish culture expression “He who took the horse has passed Uskudar” is used to say that something has been done. Another popular legend of the Tower is surrounded by a poisonous snake. A Byzantine emperor had one and only daughter that he loved dearly. The little princess lived a happy life in a palace. She had luxurious parties and wild trips organized for her. One day, at the girl’s birthday party an old wise man made a prediction. He was the wisest of all the wise men in the palace. A princess was to die from a bite of a snake at the age of 18. The family was devastated at such prognosis. The father emperor ordered to build a Tower on a tiny island. He put his beloved daughter in the Tower in hope to protect her from snakes. A basket with grapes was sent to the Tower in celebration of prince’s 18th birthday. A poisonous snake hid in the grapes and bit the princess at the first chance. Princes died at the age of 18 as predicted. The father grieved the death of his daughter. He refused to bury the body in the ground because snakes would disturb it. He ordered the body be put in a coffin and on one of the highest walls of Hagia Sophia. It is said, two holes on the coffin appeared later. The legend continues with a story of a snake which made it through the walls and bit the body of a princess. The name Maidens’ Tower may have come from this legend. 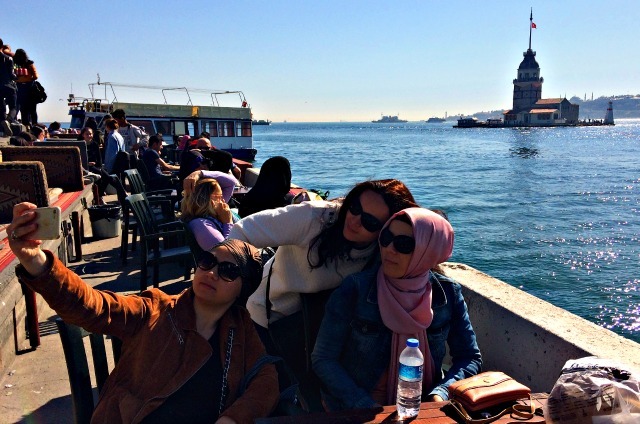 Enjoy a great view of Topkapi Palace and natural harbor Golden Horn from top of the Tower. Skip the restaurant for price reasons. Enjoy the breeze from Bosphorus with a drink from a cafe. Bring an extra scarf to rap yourself during wind. The Tower is surrounded by water. It's always windy there. Treat yourself with a romantic boat trip to the Tower and a dinner. Organize your special celebrations up to 20 people here. Weddings, parties, corporate retreats. 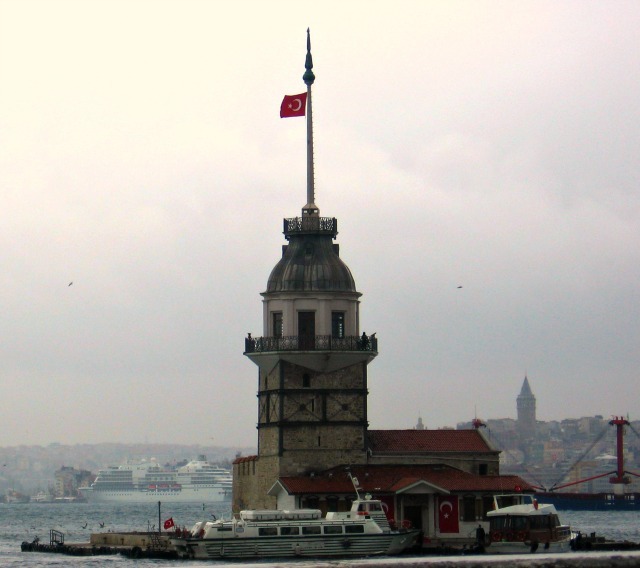 Enjoy a cup of Turkish tea at a shore cafe in Uskudar overlooking the Tower. Bring your own snacks and Turkish bagel (simit) to have with your tea. Yes, you are allowed to bring your own food to this cafe! in movies: Hitman (2007), The World Is Not Enough (1999), From Russia With Love (1963). in television series: Valley of the Wolves (Kurtlar Vadisi in Turkish) (2003 - current). in video game Assassin's Creed: Revelations (2011).